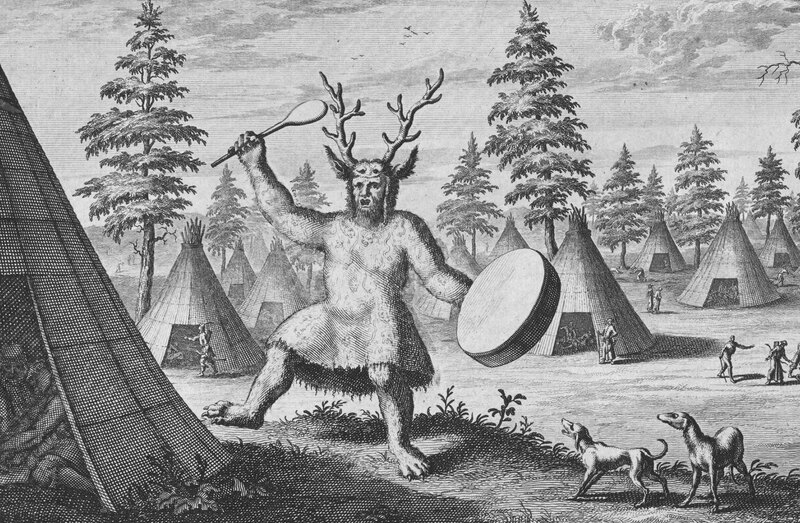 Depiction of an Evenki Shaman wearing antler headdress (Witsen, 1785). Image credit: Aimée Little et al. Flint blades, hammerstones and burning were among the tools and techniques they employed to fashion reproductions of shamanic headdresses discovered during excavations at the Early Mesolithic site at Star Carr in North Yorkshire. The research published today in PLOS ONE is the first scientific analysis of the oldest known evidence of a shamanic costume in Europe. It challenges previously held assumptions over the care and time invested in the modification of the animal’s “skull cap” in order to create these ritualistic artefacts. Instead the study, part of a five-year project supported by the European Research Council, Historic England and the Vale of Pickering Research Trust, suggests that hunter-gatherers achieved this through expedient manufacturing techniques. These may have involved packing the skull with damp clay and placing it in a bed of embers for up to four hours both to facilitate skin removal and make the bone easier to work. Archaeologists unearthed a total 24 red deer headdresses at Star Carr representing around 90 percent of all such known artefacts across early prehistoric Europe. The artefacts are formed from the upper part of a male red deer skull with the antlers attached—the lower jaw and cranial bones having been removed and the frontal bone perforated. The majority of the headdresses were discovered during archaeological investigations at Star Carr in the 1940s though researchers unearthed a further three during excavations in 2013. The most complete of these is likely to have come from a male adult red deer though the animal was 50 per cent larger than its modern counterparts. Using techniques including 3D laser scanning allowed the team to observe and analyse a number of cut marks radiating out of perforations on both sides of the crania. The researchers, which also involved researchers from the universities of Bradford, Chester, Manchester, Groningen and Leiden, concluded that hunter-gatherers were likely to have removed the head and superficially cleaned it before starting work on producing the headdress. The first stage of the process may have involved removal of a large amount of antler possibly to reduce the weight of the headdress and make it easier to work. Some of the removed antler may have formed ‘blanks’ for the production of barbed projectile tips used for hunting and fishing. But it is also possible that, in some cases, antler blank removal happened much later after the headdress had been used; in which case the process may have been a form of decommissioning of the headdress and/or the recycling of antler. The researchers say that given the amount of worked antler present at Star Carr, including over 200 barbed projectile tips, this is a plausible theory.